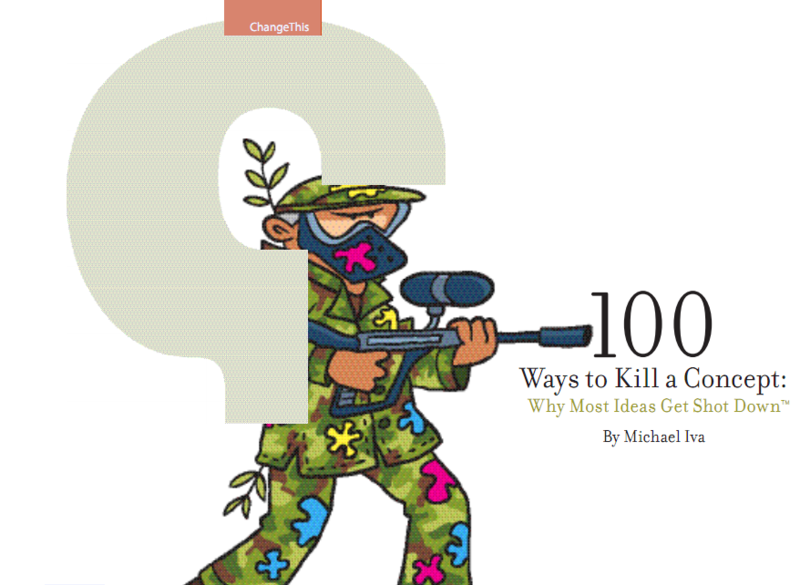 Michael Iva’s man­i­festo, “100 Ways to Kill a Con­cept: Why Most Ideas Get Shot Down”. So, you’ve got an idea. A big idea. But will your idea take flight? Not if you let your con­cept be killed by all the usu­al excus­es you hear from your man­agers, your boss­es, your spouses—excuses moti­vat­ed by fear or pos­ses­sive­ness. In this wide-rang­ing man­i­festo, Iva offers you ways to per­suade some­one to embrace your idea, to not be swayed by neg­a­tive respons­es, and to uti­lize your cre­ativ­i­ty. The boss won’t go for that. The lawyers won’t go for that. The accoun­tants won’t go for that. The client won’t go for that. The sales­peo­ple won’t go for that. The investors won’t go for that. So and so won’t like it. It won’t fit into our sys­tem. We’re not ready for that yet. I don’t think it will work. I was inter­est­ed enough to check this out from a TED newslet­ter. Pret­ty inter­est­ing TED Talk by Ste­fan Sag­meis­ter. Ste­fan Sag­meis­ter is no mere com­mer­cial gun for hire. Sure, he’s cre­at­ed eye-catch­ing graph­ics for clients includ­ing the Rolling Stones and Lou Reed, but he pours his heart and soul into every piece of work. His design work is at once time­less and of the moment, and his painstak­ing atten­tion to the small­est details cre­ates work that offers some­thing new every time you look at it. While a sense of humor invari­ably sur­faces in his designs, Sag­meis­ter is nonethe­less very seri­ous about his work; his inti­mate approach and sin­cere thought­ful­ness ele­vate his design. A gen­uine mav­er­ick, Sag­meis­ter achieved noto­ri­ety in the 1990s as the design­er who self-harmed in the name of craft: He cre­at­ed a poster adver­tis­ing a speak­ing engage­ment by carv­ing the salient details onto his tor­so. Help­ing oth­er peo­ple helps me. Hav­ing guts always works out for me. Think­ing life will be bet­ter in the future is stu­pid. I have to live now. Start­ing a char­i­ty is sur­pris­ing­ly easy. Being not truth­ful works against me. Every­thing I do always comes back to me. Drugs feel great in the begin­ning and become a drag lat­er on. Over time I get used to every­thing and start tak­ing for grant­ed. Mon­ey does not make me hap­py. Trav­el­ing alone is help­ful for a new per­spec­tive on life. Keep­ing a diary sup­ports per­son­al devel­op­ment. Try­ing to look good lim­its my life. Mate­r­i­al lux­u­ries are best enjoyed in small dos­es. Com­plain­ing is sil­ly. either act or for­get. Actu­al­ly doing the things I set out to do increas­es my over­all lev­el of sat­is­fac­tion. Every­body thinks they are right. Low expec­ta­tions are a good strat­e­gy. What­ev­er I want to explore pro­fes­sion­al­ly, its best to try it out for myself first. Every­body who is hon­est is inter­est­ing. There’s also a com­mu­ni­ty site ded­i­cat­ed to Things I Have Learned In My Life in which you may con­tribute, share, and hear oth­er people’s life lessons. PS. Thanks to Mar­co de Jong for sum­ma­riz­ing them on the TED Talk page. Project 10100 is a call for ideas to change the world by help­ing as many peo­ple as pos­si­ble. Sub­mit your ideas by Octo­ber 20th. You may do so by using this sub­mis­sion form. Vot­ing takes place on Jan­u­ary 27, 2009. Google will be pick­ing the top 100 ideas, of which 20 semi-final­ists will be select­ed through pub­lic vot­ing. From there, Google advi­so­ry board will then select up to 5 final ideas. After the final ideas have been picked, Google will bring them to life. They will com­mit $10-mil­lion to imple­ment the projects. I like how Google is doing this. Hope­ful­ly, its suc­cess­ful enough that not only a lot of peo­ple con­ceive great ideas but also help the World. If any, I wouldn’t be a bit sur­prised if those 5 or so final­ist show up on TED Talks. More details avail­able at project10tothe100.com. Good luck every­one! Let’s change the World pos­i­tive­ly. Google Chrome’s Logo Inspiration from Pokemon? As I was try­ing to con­firm my hunch about Chrome and the Poke­mon ball look­ing the same, I ran into a search result in Flickr which led me to Cole Hen­ley’s image above. Awe­some. I am not alone1. You are currently browsing the Just a Memo archives for the 'ideas' tag.